College football finally got a playoff last year, and based on the record-setting television ratings for both the semifinals and championship game, fans really enjoyed it. The playoffs gave us what we wanted — the best college football teams in a playoff on the biggest stage. That is of course unless you were a Baylor or TCU fan which finished 5th and 6th in the final playoff rankings and found themselves on the outside of the playoff despite strong resumes and 11-1 records. While many are clamoring to expand the playoff, and that ultimately might be the right move, there will always be teams that feel they got snubbed. Even the 68-Team NCAA tournament has teams that get left out each year and had really strong cases to be included in the field. The controversies that are likely to arise in the future surrounding who should get into the college football playoff are not going to be between teams within the same conference. A full conference schedule and conference championship game generally determine a conference’s pecking order. Last year, for example, there was little controversy with Ohio State, Oregon, Alabama, and Florida State being the best teams from their respective conferences as each had the best record in its conference and won its conference championship game. The Big 12 on the other hand, the “One True Champion” conference, was the only conference without a conference title game and ended up with Baylor and TCU being its two “True Champions” last year. The Big 12 will hopefully remedy this problem by adding a couple of teams (BYU and Boise State would work.) and having a conference championship game so it can actually live their mantra. 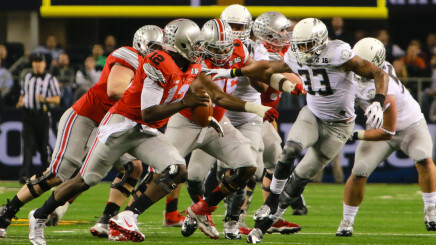 Ohio State beat Oregon in the first ever College Football Playoff. However, even if the Big 12 had a conference championship game this past year, how would the committee have known if the winner of the Big 12 Championship game was more deserving than Alabama, Florida State, Oregon, or Ohio State? 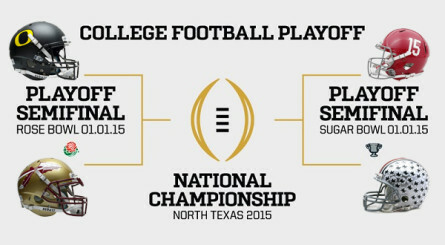 The CFP selection committee determines who belongs in the playoff largely based on each team’s body of work. Comparing the bodies of work of the top teams across different conferences is often very difficult given most of each team’s schedules are comprised of games within that conference. Last year, all but six of the combined 76 games the top six teams in the final CFP rankings played were against teams within their own conferences or against FCS and non-Power 5 teams that did not provide much help in comparing their “body of work”. Only 8% of games played by those top six teams were against teams from other Power 5 conferences, making it difficult to compare how impressive one team’s resume is relative to the others, because you don’t really know how strong the conference is in which they play. Because of the few games played between Power 5 teams, relative conference strength is often based on how conferences have performed in years past, or reading far too much into which conference has the most five-star recruits, first round draft picks, etc. To see how the draft argument is flawed, you only have to look at the Washington Huskies, which by the draft player logic must have had the #1 defense in the country last year since they were the only team to have three defensive players taken in the first round of this year’s NFL draft. The Huskies defense was barely in the top 50 in points allowed per game last year. Head-to-head competition is a much better gauge for conference strength than these other comparisons. However, most teams only play one non-conference game against another Power 5 team and many teams play zero. (I’m looking at you Baylor!). If more games between Power 5 teams were played, sorting out relative conference strength would be easier. While conference bragging rights are great, the real reason to determine relative conference strength is to inform which conference champions really have the strongest body of work and deserve to be included in the playoff. 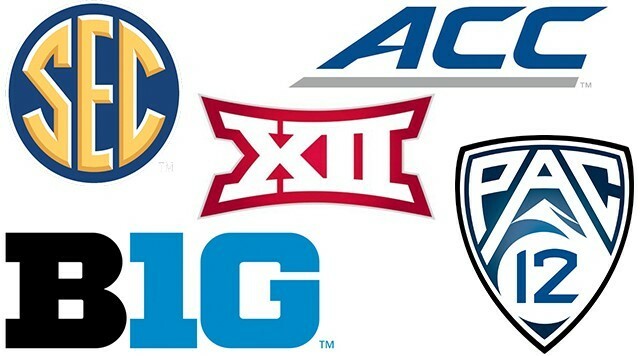 If every Power 5 conference agreed to have each team in its conference play two Power 5 non-conference opponents each year, there would be about twice as many data points (inter-Power 5 conference games) to gauge relative conference strength and therefore understand a potential CFP participant’s body of work. Even better would be to have one of those two non-conference Power 5 games take place in October or November instead of the typical September non-conference games where teams are still getting things together (e.g Ohio State’s now very puzzling loss to Virginia Tech last September). Hopefully more teams schedule matchups like Oregon vs. Michigan State in the future. Because most conferences are moving to a nine game conference schedule, it is likely that many coaches and athletic directors would oppose playing two tough out-of-conference games in addition to the brutal nine game conference schedules most conferences have. You could try to move conferences back to an eight game conference schedule, but the TV revenue is higher under a nine game conference schedule. Since college football decisions, including scheduling, are generally driven by money above all else, the nine game conference schedule is here to stay. Typical non-conference games between Power 5 teams do not draw as much revenue as conference games. Rivalry games (e.g. FSU vs. Florida, USC vs. Notre Dame) or top-10 matchups (e.g. Oregon vs. Michigan State) do really well, but your standard in-conference game does better than the out-of-conference games when adjusting for rankings and rivalry. As a result, it is likely we will continue to see about one marquee non-conference game per team moving forward. However, if the conferences and associated universities want to improve the football playoff selection process, and provide us fans with more entertaining games in Septermber, more non-conference games between Power 5 teams need to be scheduled so the committee can better compare the TCUs and Baylors of the world to the Alabamas and FSUs. No system will ever be able to perfectly compare teams in a playoff selection process, but two non-conference Power 5 games would be a step in the right direction.